Bono once compared each of the four members of U2 to parts of the human body. While he himself would be the heart of the band (due to his high emotionality), Adam and Larry would represent the feet, while The Edge would represent the head. This makes a lot of sense when we consider that The Edge (whose real name is Dave Evans) received that nickname very early on when the band was put together, because of his preference to observe things from a distance, and his overall unemotional demeanor. And, from the perspective of the Enneagram, Bono’s assessment makes even more sense. Because very few people who know this system would disagree with me when I say that The Edge is, almost without a doubt, a type Five. It’s no wonder that one of the most common names used to describe this type is “the Observer” (“the Investigator” is also used quite a lot). These are considered the most “cerebral” of the nine types, in the sense that they are the ones who tend to rely the most on their intellect. Very often, to the detriment of their emotions. Much of it comes from their characteristic passion, which is avarice. In the context of the Enneagram, avarice must be seen on a broader context, since it’s not only about being stingy with money, but also with other types of resources, such as time and energy. In other words, Fives often perceive external demands as being simply too much for them. As a result, they tend to avoid getting too involved with other people on a very emotional level, in part because they usually doubt their own capacity to give those people what they’re looking for. From this comes a tendency for having a high regard for frugality, and for getting by with less than what most people would even find conceivable. Which, from an artistic standpoint, can produce some very interesting results. 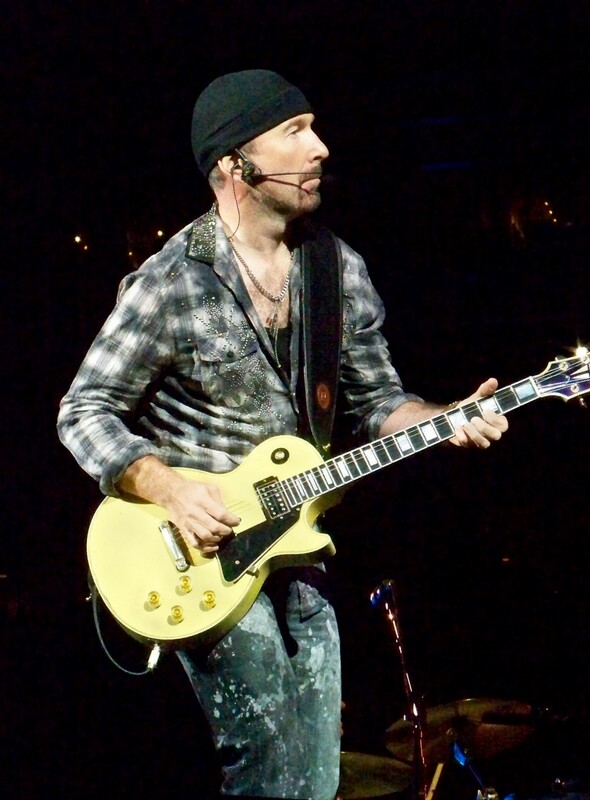 It’s hardly an exaggeration to say that The Edge is one of the most unique and influential guitarists of all time. Growing up under the influence of the punk movement would prove to be a perfect fit for a musician who considers himself a minimalist at heart, with very little interest in playing an excessive amount of notes. “I’m a musician. I’m not a gunslinger”, he says. And having this broader perspective of himself allowed him to explore unknown territories as a guitarist, giving free rein to his great interest in the technical possibilities not only of his main instrument, but also of the recording studio. In fact, although I don’t take very seriously those who criticize him as a guitarist because of his more contained style, I sometimes agree with others who say that he relies too much on the technical stuff around it all, which involves an awfully complex guitars setup during concerts. And this, by the way, can also be credited to his Enneagram type. On one hand, Fives tend to have an unusual capacity to concentrate and go deep on the work they’re doing. On the other hand, they can go too far with this, obsessing about details that may ultimately distract them from the big picture. Indeed, it has come as a sort of surprise to some fans when Bono said recently that the main culprit for the fact that U2 has been increasing the gap between album releases is The Edge. Being both the biggest workaholic and the biggest perfectionist of the band can drive everyone around him crazy. Which brings me to the matter of the subtypes, since this mix of workaholism and perfectionism is the main reason why I believe his most strong instinct in the Enneagram is Self-Preservation. Admittedly, this is not a very confident bet on my part. Partly, due to type Five’s different subtypes being considered not so different from one another, except for those who know them very well (which tends to be a hard task, as we’ve seen). But, because I neither find in him the idealism which seems to be typical of Social Fives nor the romanticism of Sexual Fives, it seems that typing him as Self-Preservation first at least makes some sense (after all, this subtype is considered the “purest” of the Fives). In general, it is said that Self-Preservation Fives have a stronger need for clear boundaries and isolating themselves, as well as a bigger difficulty than the other two subtypes when it comes to being assertive and showing aggression. Self-Preservation Fives limit their needs and wants because they believe that every desire could open the door to their becoming dependent on others. Desires, then, are either sublimated in specific interests or activities or erased from consciousness. I suppose such interests and activities could simply be hobbies for some of those Fives. But, very often, they can also be the way they make their living. And this brings me to my last point for today (and probably the one thing that bothers me the most as a U2 fan). Although, as a band, U2 has always been more Apollonian than Dionysian (in the sense of being markedly concerned with what is appropriate to display or not), for the last fifteen years or so this imbalance has grown even further. While most of the nineties saw the band reconciling with their Dionysian side (which, by all accounts, was a liberating experience for all of them), since then they’ve been finding it more and more difficult to bring a healthy level of spontaneity and chaos to the whole creative process. As a result, when they tried to replicate such experience on their 2009 album No Line on the Horizon, they simply couldn’t. It’s not that it’s a bad album, but it gives the vivid impression that they felt they had become too big too fail, and couldn’t allow themselves to let loose anymore. But the worst of all is that, since then, the band has released two albums packed with great songs (2014’s Songs of Innocence and 2017’s Songs of Experience), but those have been (for me, at least) eclipsed by a sad realization: for the first time ever, U2 is sounding like everything else on the radio. The reason I’m bringing all of this up is because I believe a lot of it has to do with the disproportionate influence that The Edge’s perfectionism has had over those albums. I actually feel kind of harsh in writing this, because I also think that most of the band’s artistic choices up to that point were more than justifiable. But I also suspect that, if I were an 11-year-old boy today (as I was when I first watched the video for “Staring at the Sun” on MTV), I probably wouldn’t care too much about U2. Not because they’re trying too hard (they always did), but because now they’re actually doing it better than before. I hope that, as the lyrics of the last song on their (ridiculously underrated) 1997 album Pop say, it’s still possible to rewind it all as one does with a tape recorder (Songs of Ascent, anyone?). But with each passing year this is becoming a more remote possibility in my heart.